Winter can feel foreboding, but for many it’s the most hospitable season of the year. design principles you can follow at home. Bare branches, steely skies and icy air—winter is seldom thought of as the most welcoming time of year. But the holiday season is often the most hospitable, and embracing winter’s delights can bring a sense of peace to interior designs. Perhaps nobody holds this aesthetic closer to home than Scandinavia, where a stark landscape and snowy, monochromatic palette are prevalent indoors and out this time of year. And yet, Scandinavian design rarely feels forbidding or cold. So how do they manage it? Here are a few ways our Nordic neighbors translate the touchstones of the season into an interior winter wonderland. At first notion, an all-white palette can seem sterile and impersonal. However, many Scandinavian interiors reflect a similarly muted colorscape without crossing the line into an ultra-modern or sci-fi effect. The return to comfort and joy is in the textural variety when dealing with a monochromatic look. Shiny glass and glossy ceramics may sit atop a table with a slightly more subtle sheen. A mix of fabrics further grounds the space, as seen above in the cottony window treatments and wooly throw pillows. And of course, a shot of greenery is always welcome in a Scandinavian-style decorating scheme to bring the outdoors inside—be it a broadleaf floral arrangement or sprigs of spicy spruce. Raw wood becomes the bare trees, the matte surface of the lamp and its lush curves become a snow drift, glass shapes become melting ice and the funky, spiky pomander ball echoes a seed pod or bonfire. It’s a little conceptual, but all together the combination is a warm, cozy corner that captures interest. With any Scandinavian-inspired decorating scheme, the key word is “simplify.” You can even take this into your holiday decor, with accessories that are more referential than traditional decorations. Stripping the silhouettes down to their most basic components (something Mother Nature does in the winter anyway) is a hallmark of Scandinavian design all year round. But there’s something extra charming about the barely-there snowflakes (or are they stars? ), trees and little birds that add a touch of visual lightness—and lightheartedness—to the seasonal arrangement. Capitalizing on what light you do get in the winter is important for a balanced look. Reflecting light in mirrors makes a space seem larger and airier, which can be key in the winter when doors and windows must remain closed tight against the cold. Place mirrors across from large windows to capitalize on the sunlight, or tuck them into darker corners to bring a candle-like glow to the shadows. And speaking of candles, it really wouldn’t be Scandinavian without a few flickering lights. However, that’s not the only way to bring extra light to your interiors: Even glassware can add light in the form of sparkle and shine to tabletops, as vases or as decor on their own. But a real candle flame, neatly tucked into a shining brass candleholder as above, adds instant coziness and intimacy that is hard to match. This final look mimics the wintry landscape indoors with clever shapes that hint at the season. The showstopping pendant is delicate and playful, bringing to mind a gentle flurry of snowflakes drifting to the ground. And speaking of drifts, the smooth matte-white chairs hint at snow piled up along the ground. 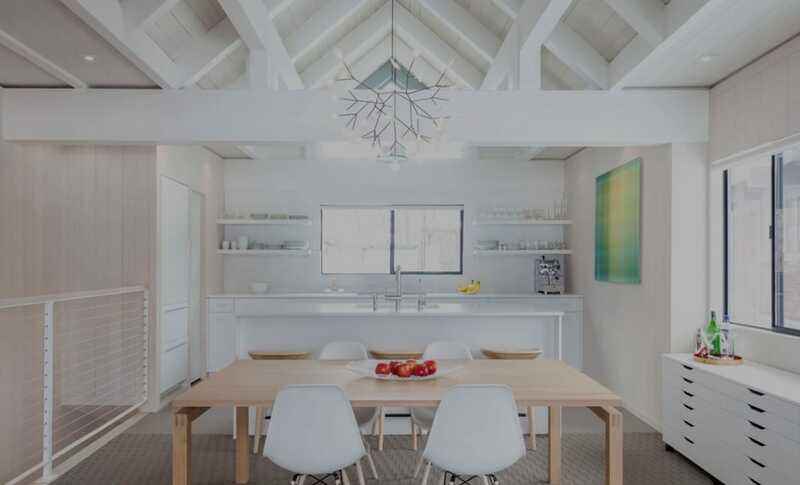 The light wood of the table and bar stools don’t detract from this mostly-white palette, while the neutral area rug grounds the space just enough to take it out of sterility. There’s even a shot of greenery in the wall art and some extra textural play in both the centerpiece and the exposed dinnerware and appliances—drawing from all the ideas above to create a homey atmosphere that makes the most of winter’s wonder.